As the Christmas season draws near, the Vatican postal service has prepared a unique set of commemorative stamps designed by a talented, yet unlikely, artist: a prisoner serving a life sentence. Source: CNS. The Vatican Philatelic and Numismatic Office’s 2018 Christmas stamps will feature images of the Annunciation and of Mary holding baby Jesus painted by Marcello D’Agata, an inmate at Milan’s Opera prison. 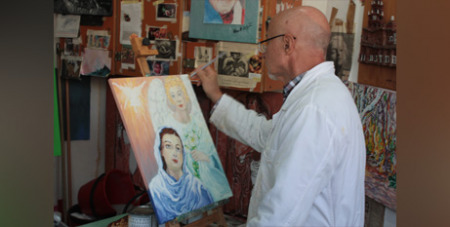 A brochure for the stamps from the Vatican post office said that choosing artwork painted by a prison inmate was a response to Pope Francis’ call for compassion toward the imprisoned and for efforts to help them see that prison is not just the end of a life of crime but the beginning of a new life. D’Agata’s painting of the Annunciation feature Mary looking skyward as the Archangel Gabriel, holding a small bouquet of white lilies, gazes at her. Directly above Mary is a white dove, a symbol of the Holy Spirit, with light beams emanating from its outstretched wings. The second stamp depicts Mary after the Nativity, her hands holding the infant Christ and nestling the sleeping child in a maternal embrace. A single red candle near them is lit while the star of Bethlehem radiates light from above. He said painting is more than just a hobby – it gave him a way to escape the confines of his prison and go to a place where his imagination was the only thing that ran wild.